Etap is the homeschool curriculum market’s equivalent to one-size-fits-all clothing. A poncho marked one-size-fits-all is supposed to fit most people regardless of body size, and Etap is supposed to fit most homeschooling families regardless of size. You pay one yearly fee and gain access to complete curriculum for grades K-12. This curriculum includes educational materials and tests for Math, Science, History, and English. All of your children can access material at their grade level without paying additional fees. Parents are typically attracted to Etap because it is an affordable option for families with multiple homeschooling children. While that is a definite advantage to the program, price alone should never determine your choice in curriculum. Beyond the affordable price, the biggest advantage to using the Etap curriculum is the ability to complete schoolwork from any location with an Internet connection. The entire program is contained in the website, so you do not have the expense of purchase schoolbooks or the hassle of hauling schoolbooks around when you travel. Another advantage is having all subjects presented through one source in the same layout. You do not have to find a different curriculum for each subject and then repeat for each child. Etap allows you to purchase a complete core curriculum for all children and all subjects in one place. Once your children familiarize themselves with the program, they can move through their studies each year without spending time learning new programs. 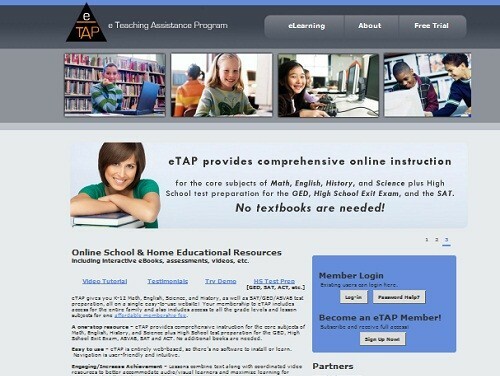 You may choose to supplement the Etap program with additional resources, but you do not have to do so. Most children can do the lessons on their own, which frees you up to get other things accomplished in your day. Not all parents like the design of the Etap lessons. Each lesson includes a pre-test, up to three pages of instructional material, and then a lesson test. The pre-test reveals how much of the material the child already understands, while the final test reveals how much of the learning material the child comprehended after the lesson. All of this basic learning material is in written form so students can read it at an individualized pace. Each lesson will also link out to YouTube videos and other resources that can be used to supplement the lesson. Using these supplementary materials is up to the child, so some will use them while others will not. There are also coordinating Discovery Education videos, but parents must pay for a subscription to that service in addition to purchasing the Etap program. These videos are designed to help students who learn better through a sensory experience. Some parents and students simply do not find the Etap lessons engaging. Children who do not want to sit and read instruction material for all of their subjects on a daily basis may easily grow bored with this type of curriculum. Parents of 3+ children trying to homeschool on a budget. Parents with little to no time to plan and coordinate curriculum on their own. Parents who cannot directly participate in teaching their children every day. Families who travel frequently and need to homeschool on the road. If you are more of a hands-on homeschool parent and enjoy the process of planning curriculum and pulling different resources together, you are probably not well suited to Etap. If you find yourself in the above statements, then it may be worth taking the free trial to see what you think of the curriculum offered. Click here to visit the Etap site for more information.